A fitness tracker makes a great Christmas present for anyone who enjoys exercise. How do you choose the best tracker? The tracker is a small device worn on a wrist band or a belt clip. It contains sensors and meters which monitor its movement. On-board software then analyses the movement and works out what you have been doing, producing a raft of exercise data. Apollo 11 landed on the moon with far less computing power! WHAT SHOULD I CHECK BEFORE BUYING? The tracker works with an app on a phone, tablet or laptop. Make sure that you have a compatible device to set up the tracker, download the records and analyse progress. You will be wearing your tracker for long periods, so it needs to be lightweight and have a reasonable battery life. The wristband or belt clip has to be secure. Most importantly, look at the data that is collected. Not all trackers record the same information, so make sure you can get what you want from your tracker. WHAT TRACKERS ARE BEST FOR MY SPORT? Runners have a bewildering choice of trackers. 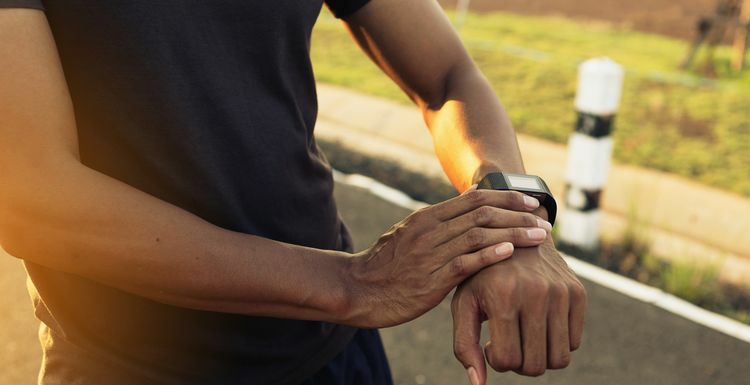 Look for monitoring of steps, distance and time taken on your run. If you would like to track your route, you need a GPS function on the tracker. Heart rate monitoring is another useful function, although bear in mind that this and GPS are going to reduce battery life. As does that morale boosting MP3 play function, but it might be worth it! Swimmers or triathletes need a tracker that is properly waterproof. Anything labelled ‘water-resistant’ won’t stand up to a pool session, so check the label to make sure you have the right version. The Apple Watch 2 and the Fitbit Flex 2 are two of the newest waterproof trackers. They record session length, number of laps and estimated calories used. The Apple device can even tell you strokes used and your average pace, along with many other features. No tracker helps with fitness if it is still in the box, so why not encourage early present opening? Then you are all set to head to the gym, pool or track and start seeing some progress. I have got a waterproof Fitbit Flex and it's amazing how it recognizes the different strokes. I would recommend one to anyone who wants to make swimming more interesting. I am getting a fitbit for Christmas - can't wait! I think it will be really motivating. So many people I know have them now. They're becoming the norm/. As a 'late adopter' I will be on ebay just after Christmas seeing what is going from people who are upgrading. I am amazed at the tech that you can get now. I would love a fitness tracker for Christmas but they all seem to be very expensive, which when you have little kids seems very indulgent. I hope they come down in price soon.